« The Storm Before The Calm? All weekend my little girl put a smile on my face, because of the abundance of her own smiles parked right below her button nose. She is such a cheerful butterfly in my life right now, full of gutteral garbles and chattering. None of it making any sense, other than the wonderfully clear “Hi!” she lavishes on each passing soul. Yesterday, she spent part of the afternoon dressing and diapering her bears and babies, grunting dramatically over their weight as she moved them here and there. 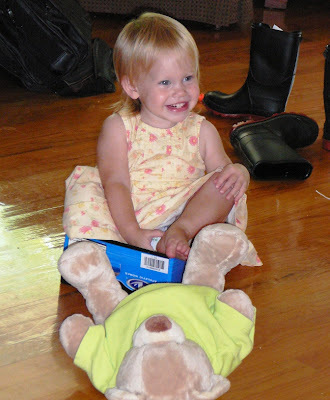 However, her finest moment was her attempt at squishing into a kid sized shoe box, as she practiced rolling her “Rs”. I could look at these smiles and six pearly toofers all day. She’s beautiful! 🙂 I didn’ t realize we had daughters close in age. Mine is 16 mo. how old is yours? She is a sweetie pie! Always all smiles when I happen by! :-)I wish time would freeze for our babies…at least for a little while. Thanks gals…It is hard to believe, but Faith will be nineteen months at the end of this month. And I’ve really wanted to push the freeze frame button lately. She’s at such an inquisitive, exploratory stage. I am dreading the upcoming doctor’s appointment when I have to admit that my 19 month old only has a 2-3 word vocabulary Katy, you know how much I hate doctor visits! I had to do the same thing with Audrey–last dr’s visit, I’m not even sure if there were 2 or 3 words. My doc doesn’t have kids; I bet your doc doesn’t have as many as you, so they only have book knowledge–no practical knowledge about the fact that babies just don’t NEED to talk–there are so many other family members who talk for them!! 🙂 Good luck with the doc–hey, recounting the visits always makes entertaining blog entries! :)You better believe I’m teaching my boys what grade they’re in this year! !